Our line of eye, lung and hair care is meant to protect you when making soap and cosmetics. Use safety glasses and facial masks anytime you are mixing chemicals to protect from splashes and inhalation and use a hair net for safe and sanitary practices. 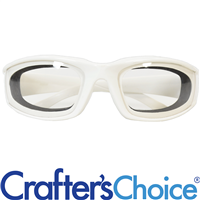 These Crafter's Choice branded soap safety goggles are the perfect pair to protect your eyes when making soap. Goggles are lined with protective polycarbonate foam around the frames for a perfect fit to the face, which prevents any splashes from coming in contact with the eyes. Hairnets are ideal for hair control and following good manufacturing practices when making soap and other products to sell. Our Basic Procedures Mask covers the mouth and nose to prevent from directly inhaling chemicals. This mask is especially important to have when mixing lye for handmade soap. This Mask with an Exhalation Valve protects lungs from larger airborne particles. 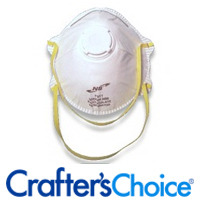 Allows for easier breathing when making product with dangerous airborne chemicals.